Welcome to this April briefing. Amazingly, I heard it said at a convention in New Orleans, “You earn the average of the 6 people you spend the most time with”. Can it be true? I think so. Seek out high achieving, sensible knowledgeable people. Go on their courses, buy their books, find a good mentor, listen to audios, podcasts in your car or on the train and see the results you will get. 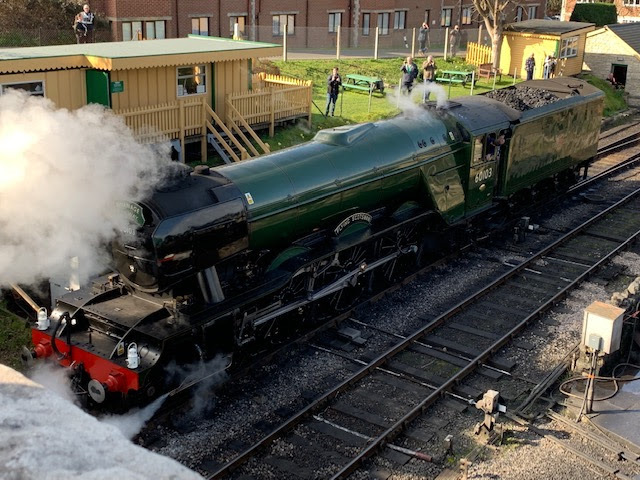 This week I have been in Corfe Castle traveling on and getting the chance to examine the footplate of the iconic steam locomotive, “The Flying Scotsman”. It has been an amazing coup for the heritage railway, leasing the engine for a couple of weeks Click Here. While traveling I was reminded of a few issues to think about. Traveling seems to do that to our minds! Never forget the amazing history of creativity and inventions we have in this country, while we are bombarded by the news reporting negative issues and problems. Take a time-out of your day to visit unusual things. It stimulates the mind and the creative juices. You have to give everything you want to achieve 100%. It’s no good putting in 99% of what is needed. Water boils at 100 degrees centigrade and the steam created drives the pistons of steam engines. At 99 degrees, water is not energised. It needs one degree more of heat and eureka! Give what you do that extra degree. Graham Jones and I will be running our Top Master Class on 16th May. Here is what we are doing and why we are doing it. When we stood down from the Chairman and CEO at the UK Professional Speaking Association, we decided to continue meeting every 6 months, to brainstorm new material, new ideas and share what we had recently learnt. Then we had the idea of opening it to people, enabling us to share in an inexpensive way – powerful ideas and educational material that will help their careers and businesses. Finally we asked ourselves, how can we make this really effective, maximise everyone’s time and cover an extraordinary amount of key issues? We came up with 17 sessions of 17 minutes in a day. Then “naysayers”, said it couldn’t be done. Well, that is like a red rag to bull to both of us. Session 01 Leadership starts with you! Session 03 Personal branding, what are your USP’s? Throughout history, there have been negotiations about where the negotiations should take place, who should be there, what food should be available and the timetables. Sometimes the preliminary negotiations have been more difficult than the negotiations themselves. Mike a newsletter reader sent me the article below. A young negotiation advisor suggested to Prime Minister Blair at the Northern Ireland peace negotiations that they should have a diamond shaped table. As Sinn Fein and the DUP couldn’t even agree where to sit. With a diamond-shaped table you don’t sit opposite and you don’t sit side by side. The diamond shape gives the feeling you are on the same side. Think carefully where you sit to have an impact for any meeting. In life, it’s often the little things that make the difference. This is a great question to ask yourself. In my job, in my life – What is the difference that will make a difference in my business and in my life? Below are the links to my complimentary resource library. If you like any of them, please pass the links on to your friends and colleagues and if you can, “like them” on social media. Graham Jones, the Internet Psychologist, sales expert and university lecturer, and Derek Arden the UK’s Number One Negotiation Speaker, negotiation expert and inspirational leader invite you to join them for a one-day exclusive masterclass that will dramatically improve your business. 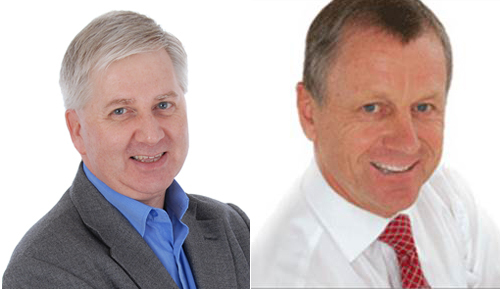 Graham and Derek are two of the UK’s leading experts on the art and science of presenting, selling, influencing and negotiating – both face to face and on the Internet.